Anyway, I’m in the market for a tablet this Christmas, just like millions of other people. I know what I want to use it for, but I’m not sure what kind to get. I’m talking watching movies, reading ebooks, and it doesn’t have to come with the bells and whistles of an expensive iPad. I won’t be playing games or downloading music on this thing. In fact, a minitablet is perfectly fine with me. So knowing what I want, I have to go to the review to get my answers. I’ve been on Wal-Mart looking at the prices and Amazon checking out the reviews. 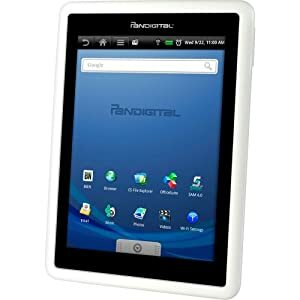 I found a Pandigital for less than $80 on both Amazon’s and Wal-Mart’s website and immediately wanted to know what the deal was. Let’s face it. At this price, I wanted to know what it was lacking compared to an iPad. I found this review and thought, that’s EXACTLY what I wanted to know. …. It’s also NOT a Galaxy Tab or any of the numorous other high dollar high end tabs out there. That being said, lets talk about what it is. A VERY inexpensive, very cool android table and book reader. That was it…and what convinced me not to buy this tablet. But what I really want to remark on is jdh4321‘s review of the tablet. He told me everything I wanted to know upfront. It also left me in confused about why anyone would think at this price, the Pandigital could even be compared to an iPad that runs about $500 (I’m guessing because I really don’t know the price. I just know it’s out of my range and not even worth a second thought). Why people? WHY?? Instead of reacting with my wallet, I reacted by wanting to do my own research and I’m glad I did. It saved me some money. If others are posting bad reviews because they feel like they’ve been swindled into thinking this was the best alternative to an iPad, then you should fall back on the old saying of, “You get what you pay for” and stop blaming the device. Of course, if it’s been poorly advertised, then it’s the manufacturer’s fault and perhaps those reviews are based on having been mislead. If that’s the case, then people are within their right to blast the manufacturer. But still, an $80 tablet and you think it’s an iPad? Seriously, folks. That would’ve had me screaming–and it had–red flag. That’s why you open up another browser, instead of your wallet, and start looking for why it’s so cheap and what it has versus what it doesn’t have. But then again, jdh4321 already did that for you, and I, for one, appreciate it. I pay a lot of attention to reviews, and I read many of them before I make a purchase decision. I’m right where you are Marcia. I’m still in the review stage. I keep seeing these dirt cheap computer pads and I don’t want to pay the lowest price for a piece of junk. I got a netbook that I had to take back because it connected to the internet when it wanted too. I’ve also been looking at the kindle fire. It seem pretty good but, being that it is coming out this month, not that many reviews available. I’m seriously thinking about the Kindle Fire and the new Nook Tablet. It’s going to be a tie between the two because I’ve heard they both are very comparable to the iPad for less than half the price, too. Also, I’m with you about paying a cheap price for a piece of junk. The last thing I need it so be out of more money and wasted time on a device that’s built up my hopes and dreams only to dash them to pieces.